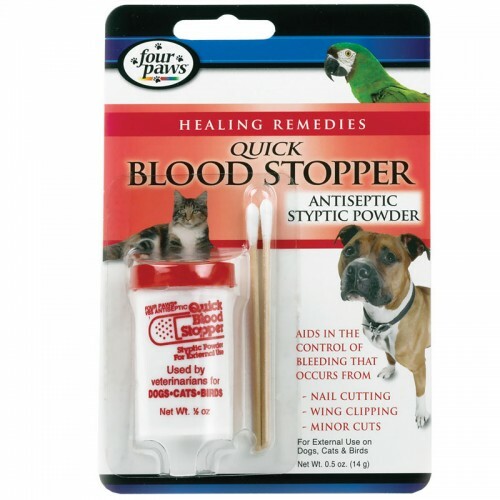 Four Paws® Quick Blood Stopper Powder is an antiseptic powder used by both veterinarians and breeders to aid in stopping blood when docking, cropping and/or nail cutting. For use on dogs, cats and birds. Pour a small amount of powder into cap. Dip moistened cotton tip into powder and apply directly to the area being treated. Apply moderate pressure for 5-10 seconds. 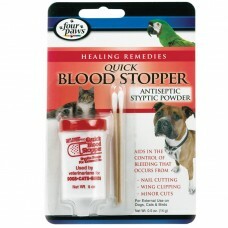 If bleeding does not stop, consult your veterinarian. NOTE: Keep desiccant bag in vial at all times to keep consistency of powder. Ferric subsulfate, Diatomaceous earth, Ottasept extra, Aluminum chloride, Bentonite, Copper sulfate, Ammonium chloride, Biopal VRO-20, Syloid.